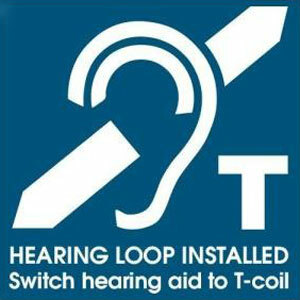 A: A hearing induction loop is a special type of sound system for people with hearing aids. The hearing loop provides a magnetic, wireless signal that is picked up by the hearing aid, enabling the wearer to hear the speaker’s voice over background noise. Q: Can you see the hearing loop? A: No, the hearing loop does not affect the venue’s architecture or appearance at all. Q: How do people know that a hearing loop is available? A: The venue will post the internationally accepted symbol. Q: What is the biggest challenge to hearing loop effectiveness? A: User education is actually the biggest challenge. Many people have no idea that their hearing aid or cochlear implant has a T-coil. Even if an organization posts the universal hearing loop symbol, people may not fully understand that they can easily take advantage of the technology using their existing assistive hearing device. It helps to provide some information about T-coils on signs, in programs and in public presentations.